Apache Cassandra was initially developed on Facebook by Avinash Lakshman and Prashant Malik to power the Facebook Inbox Search feature. Lakhsman was also one of the author of Amazon's Dynamo paper. Cassandra was released as an open source project on July 2008 in Google Code. On March 2009 it became Apache an Incubator project and graduated as an Apache top level project in February 17, 2010. The Cassandra name was taken from the Greek mythological prophet. Massively scalable architecture - a masterless design where all nodes are the same, which provides operational simplicity and easy scale-out. Active everywhere design - all nodes may be written to and read from. Linear scale performance - the ability to add nodes without going down produces predictable increases in performance. Continuous availability - offers redundancy of both data and node function, which eliminate single points of failure and provide constant uptime. Transparent fault detection and recovery - nodes that fail can easily be restored or replaced. Flexible and dynamic data model - supports modern data types with fast writes and reads. Strong data protection - a commit log design ensures no data loss and built in security with backup/restore keeps data protected and safe. Tunable data consistency - support for strong or eventual data consistency across a widely distributed cluster. Multi-data center replication - cross data center (in multiple geographies) and multi-cloud availability zone support for writes/reads. Data compression - data compressed up to 80% without performance overhead. CQL (Cassandra Query Language) - an SQL-like language that makes moving from a relational database very easy. You can see the references section at the end of this article to learn more about the basics and the detail of Cassandra. Before we install any prerequisites and Cassandra, let's update our system to latest update available. You can run the command below to get the latest updates. Apache Cassandra is run on top of Java Virtual Machine (JVM). We'll install Oracle JDK 8 on the system before we install Apache Cassandra. Apache Cassandra can also run on OpenJDK, IBM JVM and Azul Zing JVM. We will install Oracle JDK using the Webupd8 team team PPA repository. The -y option above will make you agree automatically with the packages to be installed including dependencies. If you want to check what packages will be installed you can remove the -y option above. Since the system is already at the latest update and we already installed Oracle JDK 8 on the system, we can start installing Apache Cassandra now. First of all, let's add the DataStax repository key. Add DataStax Cassandra repository to a new apt source list. Make apt-get read the metadata of Cassandra repository. Now let's install Cassandra 2.2. This is the latest stable version of Cassandra at the time of writing. You can check Planet Cassandra Download Page for information on the latest stable relase of Apache Cassandra. This is optional, we'll install Cassandra utilities. The information above is actually false. The Cassandra process is running but it report that it could not access Cassandra pidfile. This is due to bug on the Cassandra init script. We'll fix this in the next section. We will not do anything now, so just type quit on the cqlsh shell. After changing this line, if you check the service status it should return correct status info. The default cluster name for Cassandra is Test Cluster. In this section, we'll change cluster name to something else. First of all we need to stop Cassandra and delete all the data. Connected to HostPresto Cluster at 127.0.0.1:9042. Let's try our Cassandra installation by creating a movie database. First of all let's create a keyspace, this is a namespace for tables. The keyspace name below is **moviedb***. <pre><code><br />The table is ready, now time to add some data. <pre><code>Let's see everything that we added to the table using ```SELECT```. We need to create an index for title column so we can search based on title. (1 rows) cqlsh:moviedb> ``` That's it, the basic usage of Apache Cassandra. If you want to try Cassandra first without installing Cassandra on your computer or server you can use Try Cassandra. 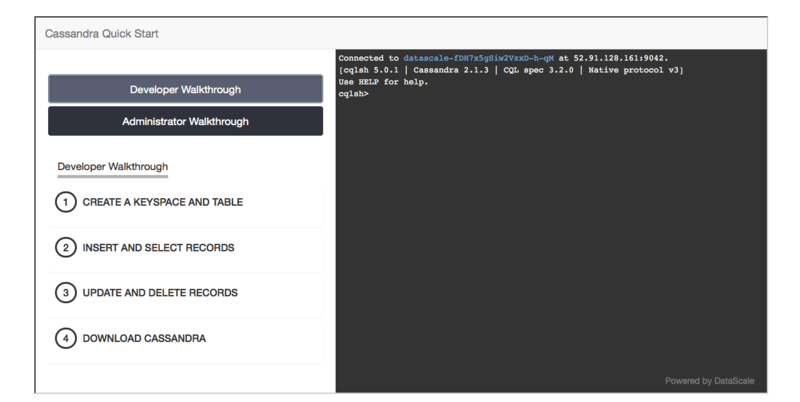 In this tutorial we learned how-to install Apache Cassandra from the Datastax repository. Do some basic configuration and also the basic usage of Apache Cassandra. Now you can start exploring this single node installation of Apache Cassandra. Have Fun!